Thirty-point third quarter keys 61-35 win on Friday; Lady Buffs still undefeated in TVC. Had you watched the opening minutes of Madras' home game against Corbett Friday night, it would have appeared the Lady Buffs' offense was in sync. From a combination of ball movement and steals leading to shots or free throw attempts, Madras scored six quick points in the opening minute and change. But soon after that, the hoop looked increasingly small. The Buffs went on to score only three additional points in the first quarter, and at halftime, led Corbett 24-19. There was no simple fix for the drought. The Lady Buffs were looking for the open player and taking mostly good shots. They simply couldn't get many to fall. "It was really frustrating, but the flow kind of gets better throughout the game," junior Annie Whipple said. As soon as the Buffs found a semblance of rhythm offensively, Corbett had little chance to contain and counter it. Madras racked up 30 points in the third quarter — just under half of its points for the whole game — in an eventual 65-31 win. They led 54-27 heading into the fourth quarter, at which point the Buffs kept their starters on the bench for most of the final eight minutes. Jackie Zamora led Madras in scoring with 16 points, in addition to six rebounds, five of which came on offense. Kaliyah Iverson had 11 points, while Jalaney Suppah chipped in nine points, and Whipple had eight points and seven rebounds. "We weren't expecting all our shots to fall right away, but we knew that our shots would slowly fall as we gained the energy back and gained our tempo back," Zamora said. Some of Madras' most complete quarters have come when everyone keeps the ball moving, and Friday was no exception. 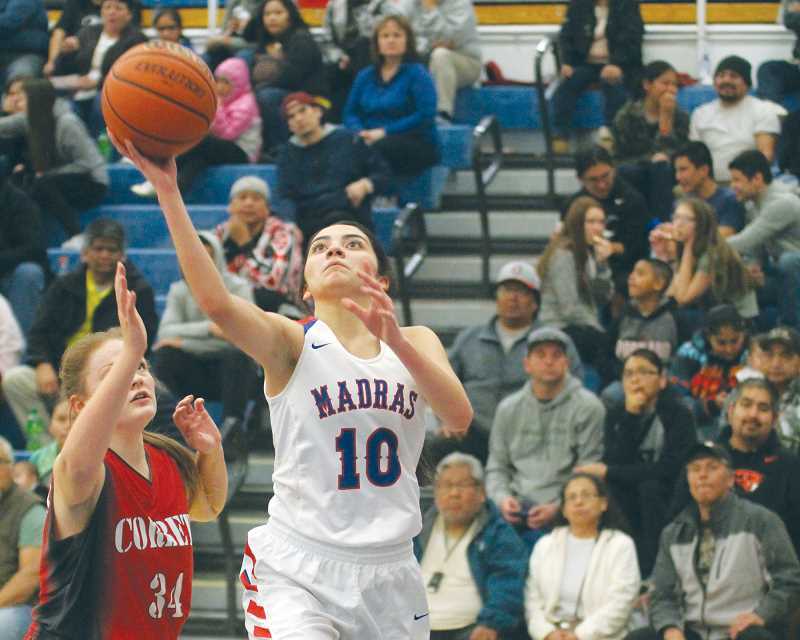 Madras recorded 19 assists for the game, seven of which came from Lynden Harry, and eight different players scored during the third quarter alone. "We know how to share the ball," Zamora said. "We all grew up together; we know how each other plays, and each other's strengths and weaknesses." It was a stark contrast from Corbett, which got 25 of its 31 points from Abby Fritz, but only two points apiece from three others. Fritz is the Cardinals' go-to scorer, of course, but the Madras defense was responsible for some of Corbett's shooting woes. "I think the big difference was the ball going through the hoop," head coach Zach Lillebo said. "Their defensive intensity picked up, which it always does after they score a couple buckets. But I felt that the first half was good defensively. We only allowed (19) points; we just couldn't hit the bottom of the net." Between the latter stages of the third quarter and start of the fourth, Madras was able to get its starters plenty of rest. Their 27-point lead entering the final quarter allowed the reserves to hold onto the lead. The scoring pace slowed down considerably, but more importantly, Madras held Corbett to just four points in the quarter. "It feels really good that our full bench can get in there, and we know that we can trust them to do good with the ball," Whipple said. "It's very relieving; I bet it takes a lot of stress off some of us." And for a game that started slow, Madras needed any edge it could find. The defense was there, of course, but so were the hustle plays — the 13 offensive rebounds, the 21 steals and a number of would-be turnovers saved. "That's another thing they love doing," Lillebo said of the hustle plays. "Not only do they do it in games, we have girls diving on the floor during practice. It's nothing really new to them. It gets the girls excited, it gets the coaching staff excited." With four wins now in the TVC, and a 15-2 record beging far and away the best of six TVC teams, a league title is Madras' to lose. But they know they can't overlook anyone, regardless of record or otherwise. "We're going to get better not by playing games; our girls are going to get better in practice each and every day," Lillebo said. "The games should come easy. That's what we've been talking about — they don't take a night off."